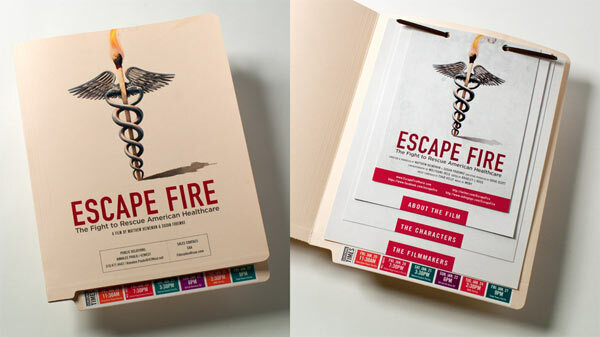 When you create a film as powerful and revealing as “ESCAPE FIRE: The Fight to Rescue American Healthcare”(Roadside Pictures/Lionsgate), the new documentary that takes an unflinching look at the problems with the American healthcare system, you need a marketing campaign that is equally compelling. That’s why Directors Matthew Heineman and Susan Froemke, and Executive Producer Doug Scott, President of Ogilvy Entertainment, turned to BIGSMACK, the entertainment agency led by Creative Director Andy Hann, to create the film’s opening title sequence, key art and an array of marketing/promo items. “ESCAPE FIRE: The Fight to Rescue American Healthcare” been hailed as “‘An Inconvenient Truth’ for the healthcare debate” by The Village Voice. Premiering at the Sundance Film Festival and set for theatrical release on October 5, the feature length documentary examines the powerful forces maintaining the status quo — a medical industry designed for quick fixes rather than prevention, for profit-driven care rather than patient-driven care. After decades of resistance, a movement to bring innovative high-touch, low-cost methods of prevention and healing into our high-tech, costly system is finally gaining ground. The film follows dramatic human stories as well as leaders fighting to transform healthcare at the highest levels of medicine, industry, government and even the US military. The film had its premiere screening at the Sundance Film Festival earlier this year. We are an award-winning entertainment agency comprised of writers, directors, producers, editors, designers, animators, strategists, audio engineers and musicians. We are more than 100 strong, occupying creative and production space in New York and Philadelphia. We are all about commercials, promos, print, interactive, design and animation, full-blown productions, show launches, network launches and rebrands, show opens, titles, marketing and upfronts. We sport the latest technology in our 15 AVID/Final Cut bays, four audio finishing and recording suites and eight Smoke/Inferno/Lustre workstations. We are partners with ad agencies, studios, networks, cable channels, sports leagues, Internet companies and advertisers direct.